Ahoy, Make a Pirate Hat From Newspaper! Not all little pirates are lucky enough to be fully outfitted with garb when they hop aboard a ship. 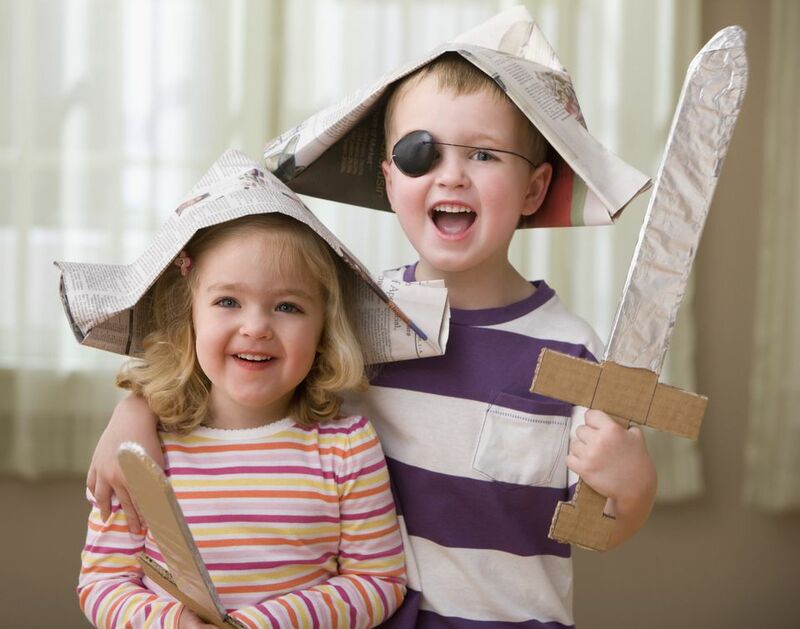 If your lil' matey is missing some gear and you've already made him an eye patch and built a pretend sword, it's easy enough to finish off the look by making him a pirate hat from a newspaper. To make this pirate hat, you will need a single piece of newspaper and some tape. Begin with a single rectangular sheet of newspaper or other soft, pliable paper. It doesn't matter if the newspaper is a little beat up—most of the flaws will be covered as you fold. Fold the paper from top to bottom. Some kids know this horizontal fold as the "hot dog roll" way of folding because, unlike the "hamburger bun" fold, it usually produces a long, thin piece of paper. Note: If you want to add another learning experience to this activity, have your child test out different types of paper and see which will rip and which will survive as you fold! Fold one of the top corners toward the middle of the paper (it will make a triangle). Leave a margin of a few inches at the bottom of the page. Right about now, your little pirate might start to get frustrated with this activity. It may not be boredom that's motivating his frustration. He may be having trouble negotiating the folds because his fine motor skills aren't yet developed enough to maneuver the paper correctly. Help them as necessary. Fold the second corner into the middle. It can overlap the first triangle a little if necessary. Add a small piece of tape to hold them together. Fold the bottom margin of one side of the paper up toward the middle to start making the brim of your hat. This single fold may cover the triangles. If it doesn't, then fold the bottom strip of paper again, so the strip is covering the triangles. Flip the hat over and fold the other bottom margin the same way you folded the other side. This may be a little harder to do without tearing the paper. If you're having trouble, put your other hand inside the hat to hold it open a little bit. Pull the hat open. If necessary, you can tape the brim on the corners to help the hat weather your little pirate's adventures. Place the newspaper pirate hat on your scallywag, and now you're ready to begin searching for hidden treasure and telling silly pirate jokes!